Two games, two easy wins and the Cavaliers are moving the ball and look to have some balance. Welcome to Cleveland, Luol Deng. Actually, the Cavs’ 113-102 victory on Friday came at Utah, just the third road win in 18 tries. But all that matters now is the Cavs are 1-0 in their first game with Deng — and whether he has anything to do with it or not, they appear energized and motivated. The Cavs blew out Philadelphia on Tuesday, and Deng didn’t even play. He had just been obtained in the Andrew Bynum trade with Chicago the previous night. On Friday, he started and played 21 minutes, finishing with 10 points on 4-of-8 shooting. Cleveland Cavaliers shooting guard Dion Waiters (3) drives on Utah Jazz small forward Jeremy Evans (40) during the first half at EnergySolutions Arena. Hardly spectacular, but as predicted, his presence alone makes a big difference. Those 21 minutes were a season-low, as Deng averaged around 32 a night with the Bulls. There will be nights when he’s on the floor that many (or more) with the Cavs. Right now, coach Mike Brown’s hope is to ease Deng into things. That makes sense, and lately, so do the Cavs. They’re young, skilled and athletic. They SHOULD be handling struggling teams like the Jazz and Sixers. Suddenly, the Cavs (13-23) are. Deng’s debut grabbed all the headlines, but it was the old standbys that looked cohesive and got it done almost all on their own. In this season of frequent frustration, that’s a good sign, folks. The Cavs actually trailed by three (49-46) at the half. They didn’t necessarily look bad, but beating a Jazz team that was missing arguably its best player (guard Gordon Hayward, out with a hip flexor) appeared to be no sure thing. Then came the third quarter, and then Kyrie Irving turned into Kyrie Irving. If you know Irving, you know that means good stuff for the Cavs. He scored 17 of his game-high 25 points in third, coolly sinking nine of 18 shots for the night and just generally running the office with composure and forcing nothing. Maybe that was the result of Deng’s presence, and maybe not. Either way, Brown will take it, because what we’ve seen this week is what he assumed the Cavs could be all along. 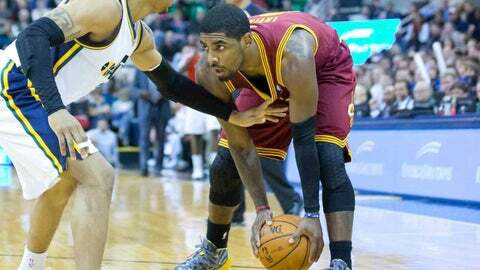 Aside from slop shots by the Jazz reserves at the end, the Cavs coasted in the second half. Their defense led to offense, their offense was crisp and confident. They led 107-87 when the benches were emptied and the Jazz called it quits. Cavs forward Tristan Thompson was every bit as valuable as Irving, compiling 18 points and 15 rebounds and missing just three of his 12 shots. If the Cavs make a run to the playoffs, Thompson probably won’t get much of the credit. But let there be no doubt, he’ll be a mountain of a reason why. C.J. 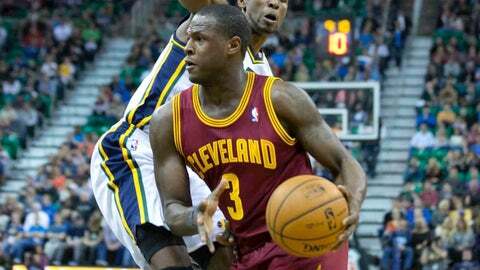 Miles and Dion Waiters each scored 17, with Miles continuing his two-game hot streak by going 6-of-7 from the floor. Jarrett Jack was masterful off the bench, perhaps better than he’s been all season, scoring 12 points on 5-of-6 shooting, and naturally, Anderson Varejao grabbed 14 boards. Bottom line: This was a fantastic way to start the longest trip of the season, with four more games on this Western Conference swing remaining, and an even better way to welcome a winner like Deng to his new surroundings.